Note: Today’s workout is a CrossFit HQ “Original Workout” circa 2003. Bring your “A Game” today for a great session! Athletes use same barbell for duration of the workout, and change out their weight. Christie is Athlete Of The Week! Congratulations to Christie who was recognized as Athlete Of The Week at CrossFit Amundson. From the moment this woman walked into the gym, she had the “Eye of the Tiger” and a keen sense of determination and mental focus. The results of this focus have been evident, and beautiful to behold! 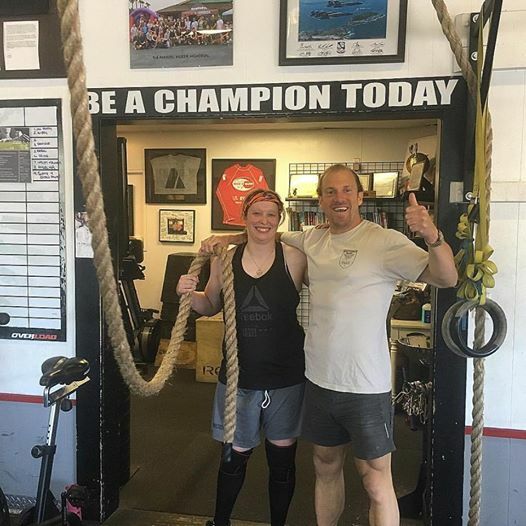 Her technical command of the Olympic Lifts, in particular the Clean, has been awesome, and her gymnastic skills improve on a regular basis, including the recent accomplishment of her first Rope Climb! Congratulations Christie on all your success, both inside and outside the gym. You’re an inspiration! Attention Krav Maga Yellow Belt students: The official Yellow Belt Test has been scheduled for Wednesday, June 14, 2017, from 6PM to approximately 8PM, followed by a Belt Ceremony at 8:30. Family and friends are welcome to attend this monumental night of testing, challenge, and accomplishment. Be sure to order your Gi and proper belt size this week! Check with Greg Amundson for any questions.